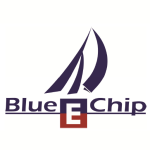 There are now five races complete for the 2014 Blue Chip regatta and the Harry Melges IV has a perfect score of 5 points. This is almost unheard of at a Blue Chop regatta and although I don't have official race results from the past - I am pretty sure Bill Allen is the only person to have won 5 races and that was surely more than 20 years ago! We are seeing something special by a special young skipper. Watching Sean's aerial video below (another from Day-1) will give you a glimpse of what we'll be looking at in the Day-2 videos with Harry IV driving both up and down wind at full speed- sorry, you'll have to wait another day. Jimmy Spithill now has the complete E-Scow experience, one we all were hoping he'd avoid - having turtled in the 5th race. The large spectator fleet is clearly rooting for him and he has been responding with some great finishes against some of the best sailors in the E-Scow class.